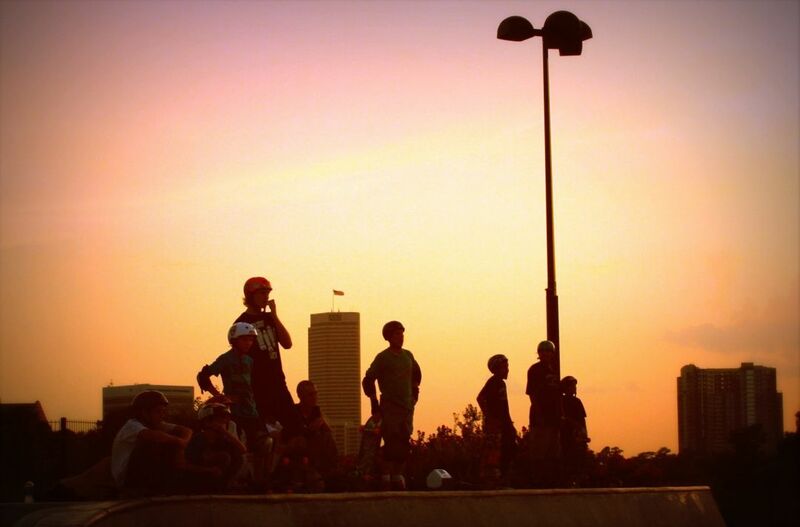 Skaters at sunset in the Jamail Skatepark before it closed last year. When the Lee and Joe Jamail Skatepark opened in what is now Buffalo Bayou Park in 2008, it presaged the growth and rehabilitation of the entire green space surrounding it. 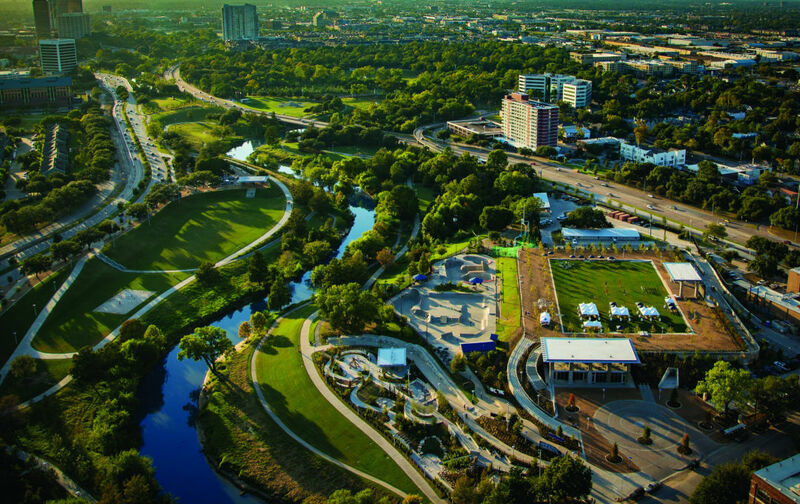 The region's first world-class, in-ground skatepark, Jamail attracted pros and amateurs alike with free admission, a welcoming vibe and stunning scenery thanks to the thicket of downtown skyscrapers just on the other side of I-45 from the 30,000-square-foot park. Initially built thanks to a $1.5 million donation from Houston attorney Joe Jamail in memory of his wife, Lee, and the donation of 45,000 square feet of land by the City of Houston (valued at $4 million), the park was a fast success after opening. It had one of the largest cradles in the United States; it gave away over 1,600 free helmets to riders to encourage safer skating; it played host to everything from competitions to concerts. Within a few years, however, additional needs were identified, including more shade, more seating and cooling stations—because nothing gets as hot in the summer as 30,000 square feet of concrete. With that in mind, the Skatepark was closed in April 2016 for $2 million worth of renovations—once again funded by the Jamail family's foundation—with an expected reopening date of October 2016. 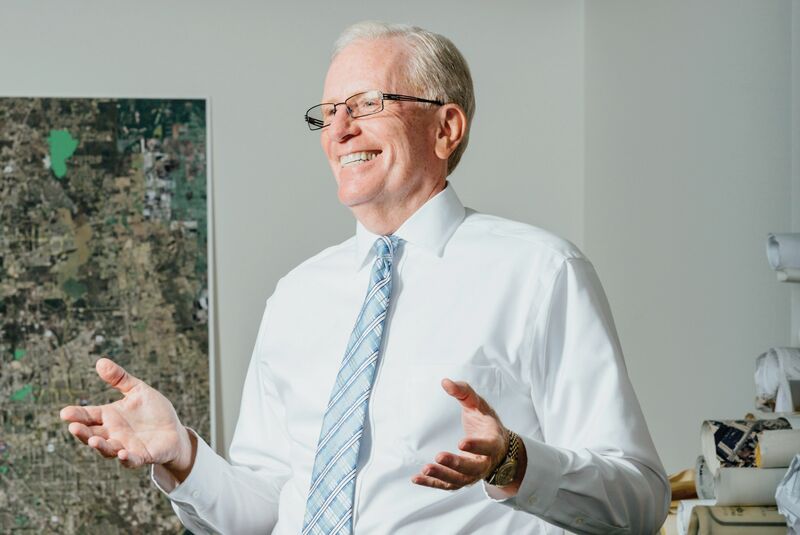 At the time, Barry Blumenthal, founder of Public Use Skate Parks for Houston (which helped get the Jamail Skatepark funded and opened in the first place), said the timeline was perhaps optimistic. "Blumenthal said it could become a nine-month project," wrote Trey Strange in the Houston Chronicle. October has passed, and so has Blumenthal's nine-month benchmark. Jamail Skatepark still sits covered in various tarps, with little to no construction or renovation going on there in months. 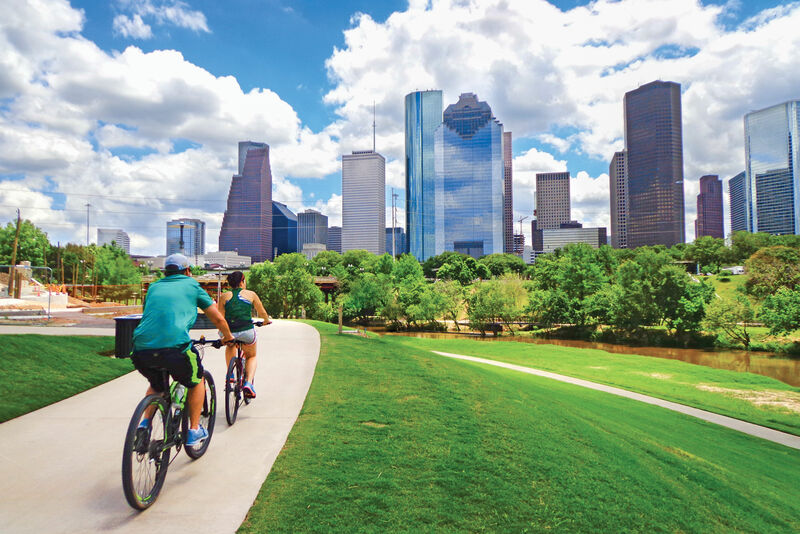 Meanwhile, everything around it—the new Water Works visitor center for Buffalo Bayou Park, the grassy Brown Foundation Lawn, the underground Cistern, the kid-friendly Barbara Fish Daniel Nature Play Area—has been attracting Houstonians to the city's newly revitalized parkland in record numbers. So why hasn't the park reopened yet? Jamail Skatepark, between Buffalo Bayou and the new Brown Foundation Lawn, would normally be packed with people this time of year. 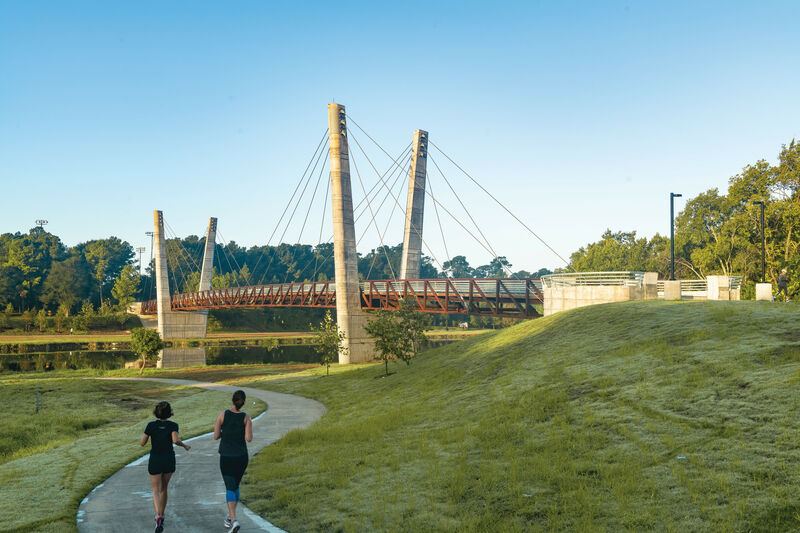 Considering its situation smack-dab in the middle of Buffalo Bayou Park, we reached out to the Buffalo Bayou Partnership (BBP) first to find out and received a bit of good news. "The skate park will open early 2017," said BBP's Trudi Smith, noting, however: "This is actually not our project, but the Houston Parks Board and the Houston Parks & Recreation Department." We then reached out to the Houston Parks folks, who seemed optimistic they'd have more news soon. "We are still waiting for a date," said Gail Brown, spokeswoman for the Houston Parks and Recreation Department. Of course, in a city like Houston where every project—commercial, civic or otherwise—runs notoriously behind schedule, should anyone be surprised by any delays anymore? That question aside, here's one we can answer for you: Where should you skate in the meantime? How about the largest skatepark in North America? 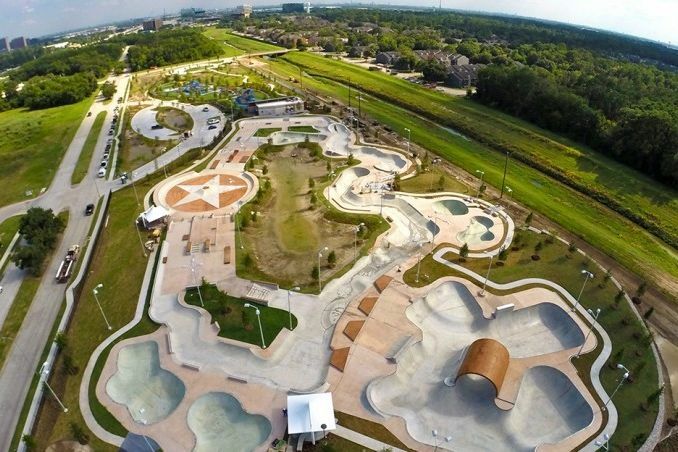 It may not be as centrally located as Jamail, but the North Houston Skatepark in Spring does have a 10-foot-deep competition bowl, a full pipe, a 12-foot vertical ramp, banked walls, speed hips and, yes, a Texas-shaped bowl, rivaled only by that new Texas-shaped lazy river downtown.